Here at US Aircraft Finance, we not only support every pilot’s dream to fly, but also the opportunity to share that dream with their best friends. Meet Cooper Hooper, a rescue pup who has come to love airborne family time! 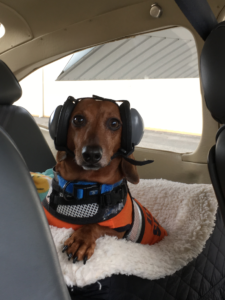 Flight-ready, he is thrilled to be accompanying his owner and personal pilot, Phil, on this trip. If using a kennel, accustom your pet pre-flight and make sure that the door latches securely. Gauge food and water needs on flight length and previous experiences. Make sure tags show proper identification (including your travel contact information). And speak with your vet regarding any specific care plans, particularly sedation. If you like Cooper’s “Mutt Muffs,” visit: http://www.safeandsoundpets.com/index.html. Our US Aircraft Finance family wishes Cooper, Phil, and the rest of their family well on all future travels together!